I’ve never been a big fan of elves in any universe, and it all goes back to Tolkien elves. After all, basically every modern fantasy story can trace its roots, directly or indirectly, back to Tolkien, especially anything to do with elves, which, prior to Tolkien, were depicted mostly as small, mischievous pixies rather than tall, beautiful (arrogant, know-it-all), and graceful humanoids with pointed ears. To be perfectly honest, though, I’ve always been a little torn about Tolkien elves. On the one hand, they have a cool culture, and Tolkien went to all the trouble of writing a whole history book and an entire language for them. On the other hand, mostly what we see of them in the Lord of the Rings is them saying “Oh, the greatest threat Middle-Earth has ever known is returning? Yeah we’ve known about that for ages. Well, we’re packing up our army of immortal supersoldiers and sailing west, see ya.” And let’s be honest, cramming a weird dwarf-elf love triangle into the Hobbit movies where it didn’t belong didn’t improve my love for elves either. All that to say, of the multitude of characters I’ve made in Lord of the Rings Online, not many of them have been elves. I made Areluin (the Sindarin Elvish words for “royal” and “blue” run together) a while back because I needed another character for crafting, and I made him and elf because I hadn’t done the elf starting zone in a long time. I didn’t think I would ever end up playing him, but somehow I ended up doing a little questing with him one night when I was bored, and quickly fell in love with the class. I feel a little bad starting yet another character on LotRO. This is the game where my altaholic tendencies were born, so I’ve done the Lone-Lands so many times that I could navigate it in my sleep, and the beauty of Lake Evendim now looks more like a painfully slow swim to the island of Tyl Ruinen (I just heard the zone referred to as “Everswim” in world chat). Also, as much as I’m loving the rune-keeper, I said basically the same things about the beorning just last Febuary. Will this character suffer the same burnout? Only time will tell, but it would be nice to get at least one of them into Moria. I’ve paid for several expansions that I’ve yet to see, and I’d like to remedy that situation. ← Is It Possible To Balance Melee and Ranged Classes? Rune-keepers are a lot of fun, and elves just make a lot of sense for them (although I guess dorfs do, too). I can’t wait to level mine to level cap as soon as I’ve found another alt that can keep her “level 75 nostalgia raid-ready” spot warm. Looking forward to reading how it goes! I’ve created a couple of RKs over the years but never stuck to one. That said I created a dwarven RK recently and have been levelling through the starter zone (he’s just got the ‘go to Bree’ quest last session). 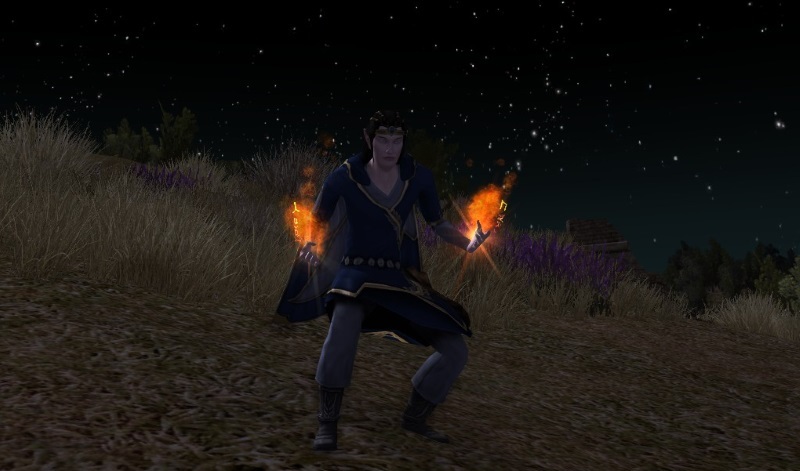 I want to do some more grouping in Lotro even if it means pugging and healer/dps is my preferred hybrid for that. The class seems a lot of fun, just as you describe – squishy but with a good amount of dps and heals.